History: The Tay are the earliest known minority in Vietnam, who are thought to have arrived from inland South East Asia about 500 BC. 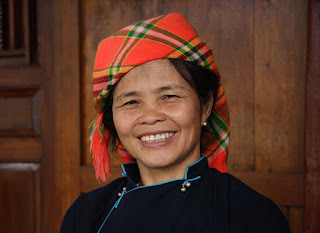 They settled in valleys in the north west part of Sapa. Language: Tay language belongs to the Tay – Thai language group. Their alphabet is based on the Latin alphabet devised in 1960, similar to the Viet alphabet. Costume: The traditional dress is made from indigo dyed cotton. It is usually plain, with little embroidery or other decoration. The women wear a simple shirt with silver buttons down the front teamed with black trousers. Both sexes wear colorful head scarves. Nowadays the Tay are often seen wearing Viet and western clothes. Social organization: The Tay social system used to resemble a feudal society. One man in each village owned the land, forest and rivers. He ruled over the people living on that land. This regime appeared very early and ended in 19th century. Tay now live in villages of mixed ethnic groups, enter into mixed marriages and leave their traditional settlements to work in other areas. 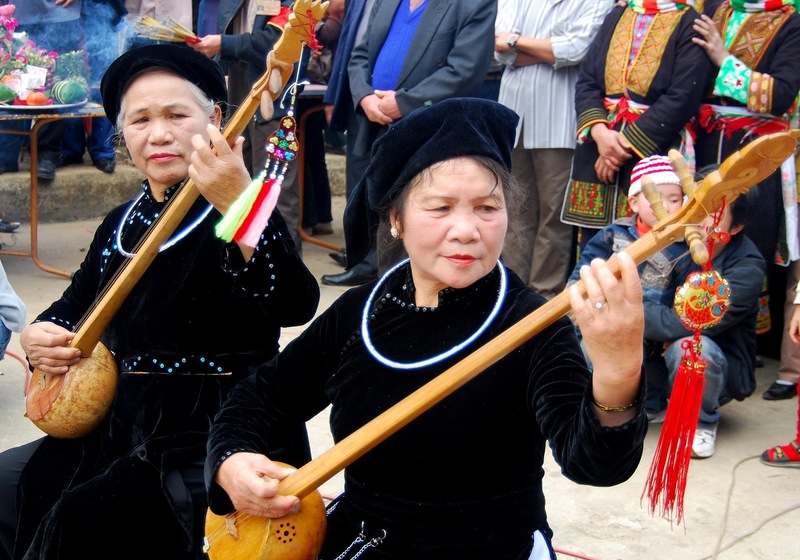 They have adopted other elements of Kinh culture and of the Tai speaking people, are considered the most integrated into main stream Vietnamese culture. Birth: While pregnant and even after giving birth, the mother and father have to avoid many different things in order for both mother and child to be healthy, for the child to grow up quickly and strongly and to avoid evil spirits. When the new born is three days old, there is a ritual in honor of the midwife. One month after the birth, there is a celebration and party to name the baby. 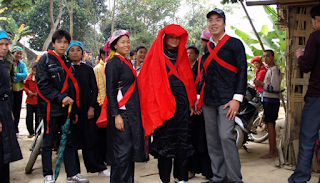 Marriage: Young Tay men and women are free to love, but the decision to become husband and wife rests with their parents. The boy’s parents need to know the potential bride’s fortune so they can compare it to their son’s. To do this, they consult an astrologer who judges how well matched they are. If the signs look favorable, the marriage can take place. After the wedding, the wife stays with her parents until she is pregnant. She will only go to live at her husband’s house in the late stages of pregnancy. Funeral: The funeral rituals are quite similar to Vietnamese. The funeral brings deceased’s spirit to the world of the after life. Three years later, there is a ritual to bring the spirit to the ancestors and to end the mourning period. There is an annual day in honor of the deceased. Beliefs: The Tay worship ancestors, the house spirit, kitchen spirit and the midwife. Housing: The Tay live in houses built on stilts originally designed to protect them from wild animals. Nowadays, they use the first floor for storage and cooking. When building a new house, the owner has to choose the right place very carefully. Many factors are considered, including his age and horoscope. On the day that he and his family move to the new house, the head of the family must start a fire and keep it burning all night. Food: The Tay used to eat sticky rice most of the time, but now eat regular rice. For festival occasions, they make many kinds of cakes such as square rice cake (banh trung – symbol of the earth), round rice cake (banh day – symbol of the sky) for the New Year Festival and pounded young sticky rice that is roasted (com) for the Mid Autumn Festival. Production activities: The Tay use traditional wet rice cultivation. The rice is grown on the hills with very little water, which is well utilised using irrigation methods like digging canals and laying water pipes. They produce high quantities of food by practicing such intensive cultivation methods.